Private Pilates sessions are perfect for learning fundamental exercises that help you make key body connections and experience improved movement. 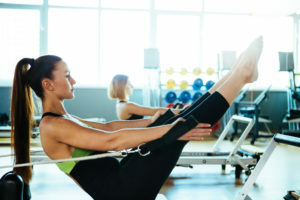 Private sessions and classes can be assisted by large apparatus such as the Reformer, Trapeze Table, Chair and Barrel. In one-on-one sessions, you’ll develop a deeper understanding of proper body mechanics, alignment, breathing and core activation that is relevant to virtually every activity you do. All levels, from beginners to highly advanced practitioners and athletes, have much to gain from private Pilates sessions. Semi-Private (Duet) sessions are also an excellent way to experience the benefits of one-on-one instruction with the added bonus of moving with a friend, colleague or partner. Have a question or need more information? No problem. Contact us today and someone on our team will be happy to help.